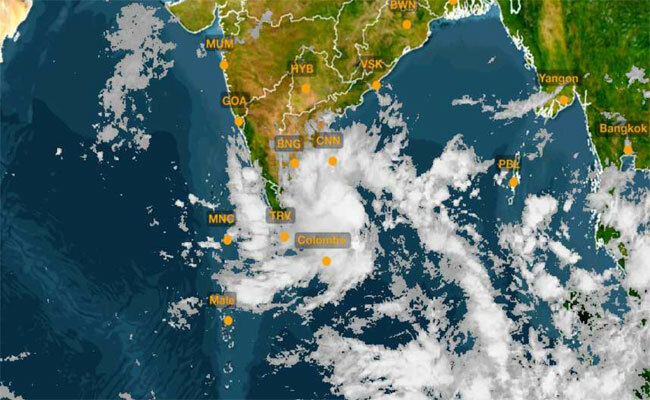 Under the influence of the low pressure system in the vicinity of Sri Lanka, the prevailing showery and cloudy condition is expected to continue over the island and surrounding sea areas, the Department of Meteorology said. A low pressure area has developed over South-west sea area in the Bay of Bengal. The general public, naval and fishing communities are requested to be attentive about advisories issued by the Department of Meteorology in this regard further. Fairly strong gusty winds up to 50-60 kmph can be expected over Northern part of the island. Showers or thundershowers will occur at times in the most parts of the island. Very heavy railfall above 150 mm can be expected at some places in the Northern, North-central, Eastern, North-western and Central provinces while heavy rainfall above 100mm can be expected at some places elsewhere. Misty conditions may occur at some places in the Western, Sabaragamuwa and Central provinces during the morning, the department said. Showers or thundershowers will occur in the sea areas around the island, it said. Heavy showers or thundershowers can be expected at some places over the sea areas extending from Potuvil to Galle via Batticaloa, Trincomalee, Kankasanturai, Puttalam and Colombo. Winds will be North-easterly over the sea areas extending from Potuvil to Colombo via Trincomalee, Kankasanturai and Puttalam. Winds will be North-westerly over other sea areas around the island. Winds speed will be 30-40 kmph over sea areas around the island and rough at times as the wind speed can increase up to 50-60 kmph at times. Temporarily strong gusty winds (up to 70-80 kmph) and rough seas can be expected during thundershowers.